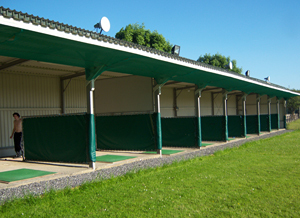 A 10 bay driving range is available on site for the golfer who wants to perfect his or her golfing skills. Golf lessons are provided by our resident golf professionals, Xavier Medas, Jim Robinson and Dara Ford, details of which can be obtained from the clubhouse. To book a lesson, please contact Rosses Point Golf Club or Castle Dargan Golf Club. The phone numbers for both are listed on the driving range page of this site. A full list of tuition rates is available by clicking the names above. 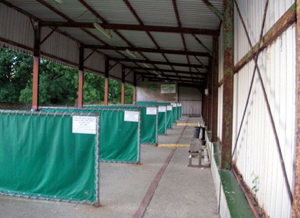 The driving range boasts two private bays for coaching or for the professional to practice in private. All our bays are spacious and come equiped with synthetic grass mats. The mats themselves are designed to be suitable for both the left and right handed player. In order to use the driving range, you must have your own equipment, as we do not provide clubs for the driving range. We cater for individuals and groups alike, but we would ask that any groups would pre book the required amount of bays in advance by contacting the clubhouse with your group details and proposed arrival times to avoid disappointment. Buckets of balls are available from the clubhouse at €6 each and contain approximately 60 to 70 balls. The driving range is also fully floodlit to allow for night time practice if required. As the floodlights would primarily be used during winter time and we operate with reduced hours during the winter season, it is advisable that you contact the clubhouse to confirm opening hours.